Movie sets can be pressure cookers, so sometimes cast members lighten the mood with the traditional practical joke. Some are better (and more prolific) jokesters than others. Here are six celebrities who have that reputation and their most successful tricks. The wily comedian/actor/writer who shot to worldwide stardom with “Shaun of the Dead” won the role of a lifetime, that of Chief Engineer Scott in the rebooted “Star Trek” series. It was during the second film, “Star Trek: Into Darkness,” that he managed to prank not only the rest of the cast, but the guest star as well. Benedict Cumberbatch was handed a tube of “specially formulated neuron cream” and told that, for safety reasons, he had to apply it to his face due to the set’s background radiation levels. Cumberbatch didn’t even bat an eye; he thought it was something to do with American safety standards. But at least he wasn’t the only one. The rest of the bridge crew fell for the same prank (and there is photographic evidence! ), but Cumberbatch was judged “most gullible” for his strict adherence to a nonexistent safety regulation, in that he actually signed a waiver mentioning the “neuron cream,” which was just regular old skin lotion. Speaking of Simon Pegg, he is not immune to being on the receiving end of a prank. 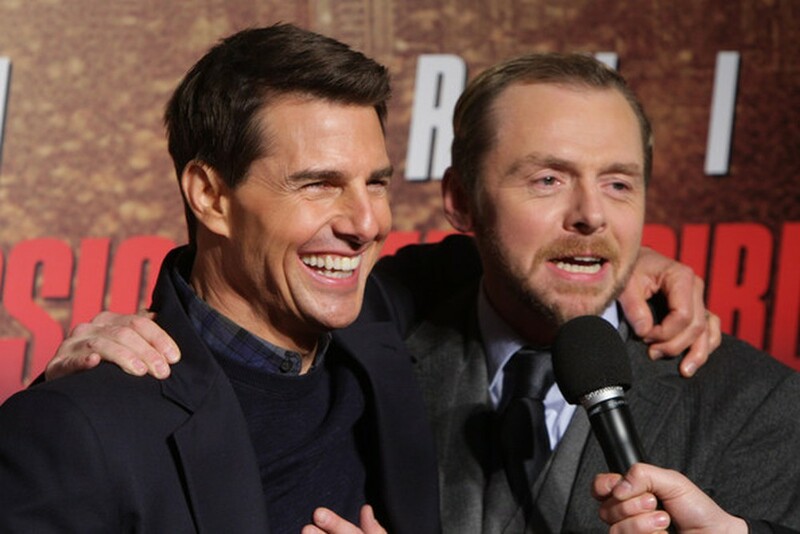 On the set of “Mission: Impossible – Rogue Nation,” when Pegg and Cruise were filming a scene that took place during a car chase in Morocco, Cruise seemed inordinately worried about Pegg being hydrated in the extreme heat, and kept giving Pegg water to drink. There was nothing wrong with the water. The problem was that Cruise kept cranking up Pegg’s automatic car seat warmer so he was sweating profusely the whole time, and chalking it up to the weather. Did we mention the scene was filmed over five days? Pegg finally sussed it out, and got back at him by taping over the light button on Cruise’s side of the car and giving him the hot seat treatment in return.